Phileas Fogg of London and his newly employed French valet Passepartout attempt to circumnavigate the world in 80 days on a Â£20,000 wager (roughly Â£2 million today) set by his friends at the Reform Club. Breaking the... read more well-established routine of his daily life, the reserved Englishman immediately sets off for Dover, accompanied by his hot-blooded manservant Passepartout. Traveling by train, steamship, sailboat, sledge, and even elephant, they must overcome storms, kidnappings, natural disasters, Sioux attacks, and the dogged Inspector Fix of Scotland Yard -- who believes that Fogg has robbed the Bank of England -- to win the extraordinary wager. 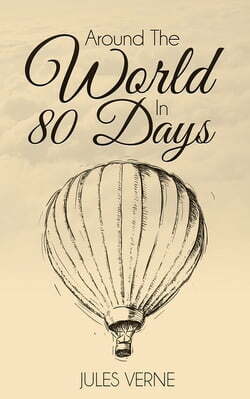 â€˜Around the World in 80 Daysâ€™ gripped audiences on its publication and remains hugely popular, combining exploration, adventure, and a thrilling race against time. â€˜Around the World in Eighty Daysâ€™ was written during difficult times, both for France and for Verne. It was during the Franco-Prussian War (1870â€“1871) in which Verne was conscripted as a coastguard; he was having money difficulties (his previous works were not paid royalties); his father had died recently; and he had witnessed a public execution, which had disturbed him. Despite all this, Verne was excited about his work on the new book, the idea of which came to him one afternoon in a Paris cafÃ© while reading a newspaper (see "Origins" below). The technological innovations of the 19th century had opened the possibility of rapid circumnavigation and the prospect fascinated Verne and his readership. In particular three technological breakthroughs occurred in 1869-70 that made a tourist-like around-the-world journey possible for the first time: the completion of the First Transcontinental Railroad in America (1869), the linking of the Indian railways across the sub-continent (1870), and the opening of the Suez Canal (1869). It was another notable mark in the end of an age of exploration and the start of an age of fully global tourism that could be enjoyed in relative comfort and safety. It sparked the imagination that anyone could sit down, draw up a schedule, buy tickets and travel around the world, a feat previously reserved for only the most heroic and hardy of adventurers. "[Jules Verne]â€™s first books, the shortest, â€˜Around the Worldâ€™ or â€˜From the Earth to the Moon,â€™ are still the best in my view. However, the works should be judged as a whole rather than in detail, and on their results rather than their intrinsic quality. Over the last forty years, they have had an influence unequalled by any other books on the children of this and every country in Europe. And the influence has been good, in so far as can be judged today." (LÃ©on Blum, L'HumanitÃ©, April 3, 1905).